Last night. Taken from the Sam Beckett bridge, Dublin. 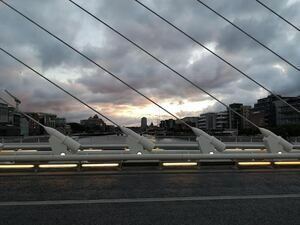 Posted in Misc and tagged Sam Beckett bridge, Sky at 9:51 am on June 19, 2018 by Chompsky. You are but we still love ya. Cloudy skies? Here, definitely here, is where you would get them.